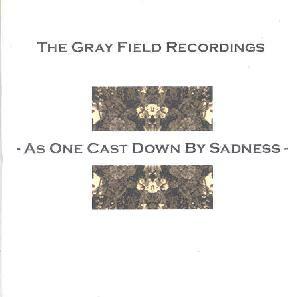 The Gray Field Recordings - "As One Cast Down By Sadness"
I don't know if I am the only one who has ever noticed before, but in the plains states there are two types of college towns - the really boring ones that have the big science/agriculture programs, and the liberal arts schools, each of which is an oasis in what is otherwise a cultural black hole. I guess this really is not that surprising, since liberal arts programs (and students) tend to be culturally focused, while scientists are not really, but the difference in the plains was very marked. Being a science geek who likes underground music is a tough thing out there. Rebecca Loftis (aka Gray Field Recordings) apparently lives in Stillwater, Oklahoma, the location of Oklahoma State University (one of those science/ag schools). It just happens to be the same town that I lived in for several years, and man, I wouldn't wish that place on anyone who has the slightest interest in avant garde culture of any kind. In a place like Stillwater you pretty much either have to drive a long way to see interesting music, or you stay home and try to make your own, which is what Rebecca did. This self released CDEP contains six beautifully crafted sparse songs, the first of which, "Chimed", is pretty keyboard oriented and droney, with either some actual chimes or ring-modulated dissonant tones. "Glintering" features ethereal vocals with looped bits of noise and acoustic instruments. Most of the songs which follow are along these lines, with additional violin and muffled, distant percussion fill things out. The last track, a cover of a celtic traditional, is especially lovely. This occupies some of the same sonic territory as contempo drone folk groups such as the early, more song oriented recordings of the Charalambides, or perhaps the Tower Recordings, and while it maybe not quite in the same league as those groups (few are) this is very cool and I hope that there is more to come. If there had been more stuff like this around maybe Stillwater wouldn't have been so boring! For more information and to hear sound files you can visit The Gray Field Recordings Mp3.com web site at: http://www.mp3.com/grayfieldrecordings. The CD is available from Homemade Music at: http://www.homemademusic.com/shop/269.html. Contact via snail mail c/o The Gray Field Recordings; 915 W. 26th St; Stillwater, OK 74074.